Whitchurch Canonicorum is a small village a few miles west of Bridport in Dorset. At seven syllables, it’s one of the longest place names in England. This may seem a little pretentious, but Whitchurch Canonicorum is no ordinary village. It was founded in Anglo-Saxon times by the most famous Saxon king of all, Alfred the Great, who called it Hwitan Cyrican, meaning “white church”. Nothing remains of the original Saxon church, but the present building – dating from the 12th to 15th century – has more than its fair share of Fortean oddities: the relics of a mediaeval saint, an icon of the Holy Grail, and the grave of one of the most unusual victims of Cold War espionage. Surprising as it may seem, there are only two places in the country known to contain the mortal remains of a genuine saint. One is Westminster Abbey in London; the other is the church of Saint Candida and Holy Cross in Whitchurch Canonicorum. Candida is the Latin word for “white”, and the saint herself is more often referred to as “Saint Wite”. 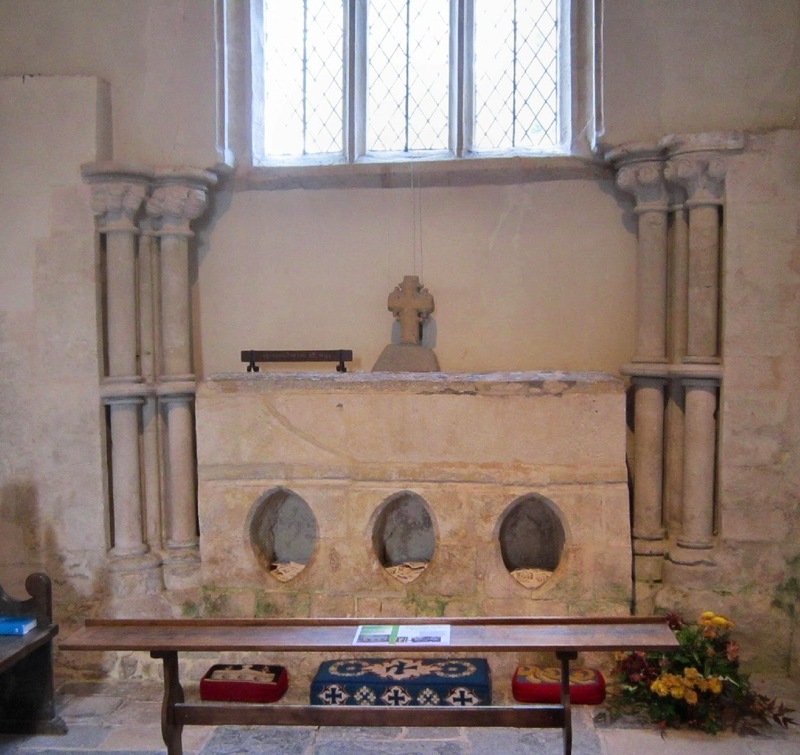 The only inscription visible on her shrine is a modern one: Hic reqesct reliqe Sce Wite (“Here rest the relics of Saint Wite”) – apparently duplicating the Latin inscription on a lead casket found inside the tomb when it was opened in 1900. The tomb itself is very plain – some people think that’s why it escaped destruction during the Protestant Reformation, when so many other shrines around the country were destroyed. 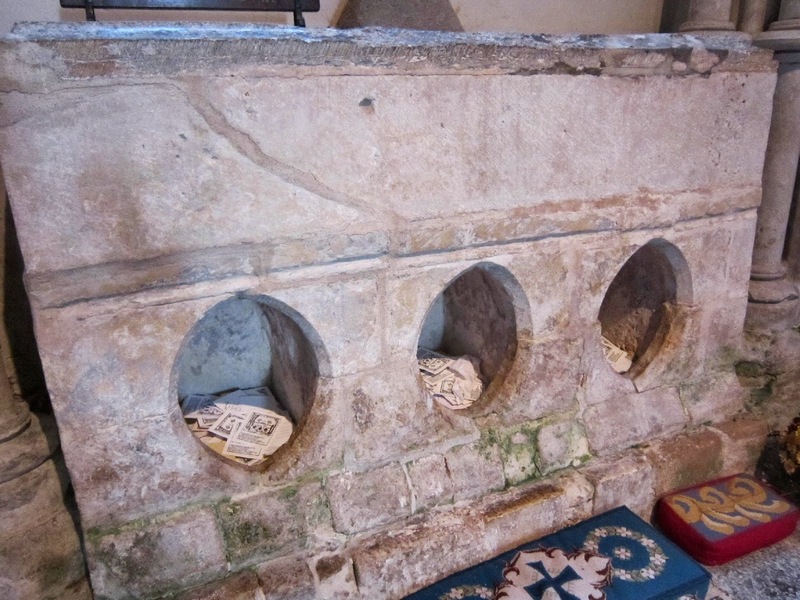 Its only distinguishing feature is the presence of three yonic-shaped orifices, where people can place prayer cards and other offerings to the saint (“yonic” is the feminine equivalent of phallic – I had to look it up on Google). With regard to Saint Wite (or Saint Candida) herself, nothing at all seems to be known about her from historical records. According to local legend, however, she was a Saxon wise-woman who was murdered by the Vikings. Whether or not it’s related to the legend, on the outside of the church tower are carvings representing a ship and an axe, which are often said to symbolize the Vikings. 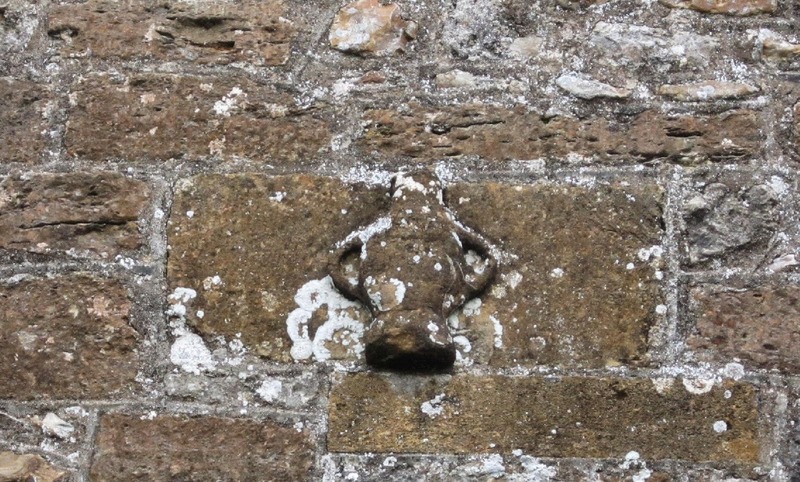 Unfortunately the images are so badly weathered they’re difficult to make out, but lower down on the church wall is another, much clearer carving. This depicts a two-handled vessel, traditionally identified as the Holy Grail. This part of the church dates from the 12th and 13th centuries, when the popularity of the Grail legend was at its height. But although the legend has a Christian theme, it’s not often depicted in church art of the time. So what is it doing here at Whitchurch Canonicorum? If it’s true that Joseph of Arimathea took the Grail to Glastonbury, he may have landed on the Dorset coast and made his way northwards from there. His route may well have taken him through the place that was later to become Whitchurch Canonicorum. Moving to more recent times, the churchyard contains one gravestone with a bilingual inscription – English on one side, Cyrillic on the other. This is the last resting place of Georgi Markov, a Bulgarian journalist who was murdered in London in bizarre circumstances in 1978. One morning he was waiting at a bus stop on his way to the BBC World Service, where he worked at the time. He felt a stinging sensation in the back of his leg, and turned round to see a man pointing an umbrella at him. Four days later he died from Ricin poisoning. The umbrella had been used to fire a tiny sugar-coated pellet into his leg; when the sugar dissolved it released the deadly chemical into his bloodstream. Phrases such as “worthy of James Bond” or “like something Q might have dreamed up” are journalistic clichés, but in this case they’re entirely justified. It’s tempting to think that a real-life James Bond discovered that Markov was a communist spy, and a real-life Q devised a foolproof method of eliminating him. But if that had happened, knowing how the British authorities normally operate, they would have botched the whole thing and Georgi Markov would still be alive and well today. In fact it happened the other way around. Markov was murdered by Bulgarian (or possibly Russian) secret agents, because they discovered he was using his position at the BBC to spread anti-Communist propaganda. And the Communists, being super-efficient and entirely non-decadent, didn’t botch anything. Georgi Markov died, and his umbrella-wielding assassin was never caught. 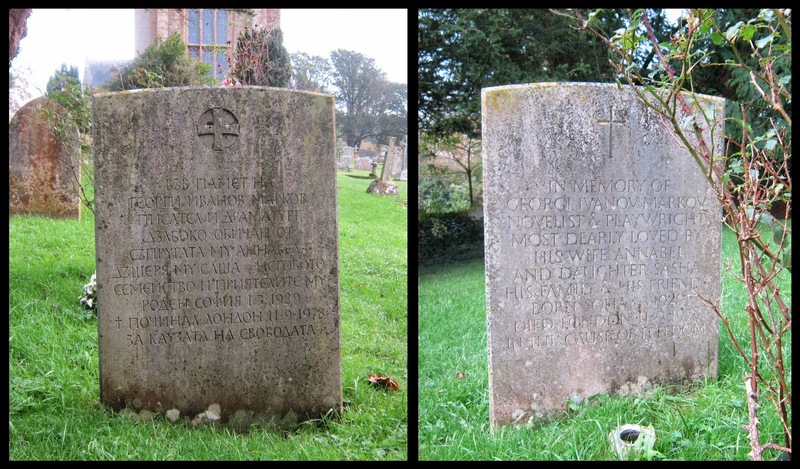 I’m not sure why Markov ended up buried in a Dorset village churchyard, though. Who would think so much weird history could lurk in one little village church? Thanks, a very interesting story. Thanks Undine. I'm afraid I wasn't aware of your Strange Company blog until I followed the link back to it - but it's now been added to my Feedly subscriptions! "I’m not sure why Markov ended up buried in a Dorset village churchyard" - I was wondering this too. The explanation seems to be that he married a lady called Annabel Mary Dilke, who The Peerage shows to be a recent descendent of the minor aristocratic Best family, whose seat is at Whitchurch Canonicorum. Happy New Year, Andrew, by the way. Thanks Ray - Happy New Year to you too! That seems a very plausible explanation - I wondered if it was something to do with being buried next to a martyr's shrine, but if his wife had connections with the village it makes far more sense.